If you're getting bored of pasta as your go-to easy carb for dinner, try out another quintessential Italian ingredient: polenta. While you could make your own polenta from ground cornmeal, it's also sold pre-cooked in tubes. Because are those nearly always available plain, made just from cornmeal, water, and salt (though flavored versions such as sundried tomato are occasionally available), precooked polenta is incredibly versatile. One big benefit of precooked, tubed polenta is how well it stays together after it's been sliced. This makes grilled polenta an unexpected but delicious side dish. Simply slice the polenta into 1/2-inch rounds, brush each slice with olive oil, and sprinkle it with salt and pepper. Set the grill to medium-high heat, and then grill the rounds for five to seven minutes on each side, or until the polenta is golden brown. Polenta can also be cubed and added to skewers as part of a kebab. Store-bought croutons have nothing on these little polenta gems. Cube the precooked polenta, and season it to your liking. That might mean just salt and pepper, or it could include dried oregano, garlic powder, and red pepper flakes. You can either pan-fry or bake the polenta cubes until they are crispy. Chill the polenta croutons, and then use them to top a salad. Lasagna is known for its long noodles, but those noodles can be easily replaced with thin slices of precooked polenta. This makes the dish extra-filling for the hungriest of people in your life. To make polenta lasagna even more unique, use pesto in addition to or instead of marinara sauce. Top the layers with a mix of Parmesan and mozzarella cheese, and sprinkle a handful of pine nuts on top for a crunch. While you might not be able to trick anyone into thinking these are the real thing (made from potatoes), polenta fries are a fun twist on a favorite side dish. Slice that precooked polenta into long wedges or strips, and brush them with a little bit of olive oil. Toss them with panko breadcrumbs and your favorite spices if you want the final result to be a bit more "fry-like," or just cook them as-is. Bake the polenta in a 450 F oven for about 40 minutes, flipping them once at the 20-minute mark. 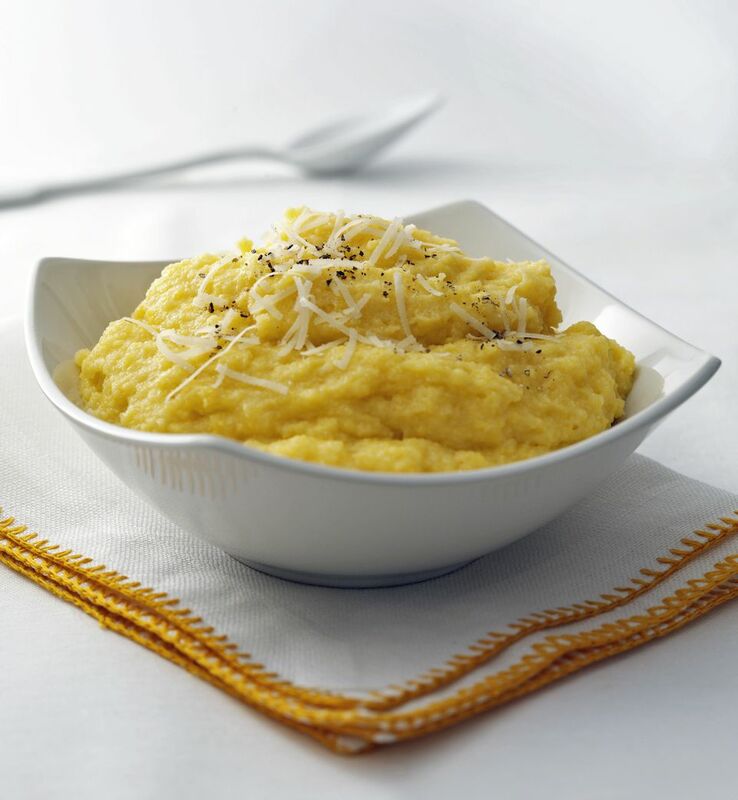 Who says that precooked polenta should be used just for lunch or dinner? It's also well-suited for serving at breakfast. First, crumble up some breakfast sausage in a pan and cook it through. Then, remove the sausage from the pan, and replace it with sliced half-inch pieces of polenta to cook in its drippings. Serve the polenta and sausage with a drizzle of maple syrup and an over-easy egg for a decadent morning meal.